John Milton Hay (October 8, 1838 – July 1, 1905) was an American statesman, diplomat, author, journalist, and private secretary and assistant to Abraham Lincoln. He was a staunch supporter of the Union and of the emancipation of slaves. He served as Ambassador to the United Kingdom (1897-1898) before becoming Secretary of State, remaining in that office until his death. He did much to position the United States within the world as a rising power, negotiating in more than 50 treaties, including the settlement of the Samoan dispute, as a result of which the United States secured Tutuila, with an excellent harbor in the Pacific; a definitive Alaskan boundary treaty in 1903; the negotiation of reciprocity treaties with Argentina, France, Germany, Cuba, and the British West Indies. He also acquired for the U.S. what became the Panama Canal Zone, where the Panama Canal was built. Hay's United States was a player on the international stage, not a bystander. This did not fully replace the policy of non-entanglement in foreign alliances, since isolationism would continue to dominate much rhetoric. However, some would begin to apply the doctrine of Manifest Destiny beyond the American continent to the rest of the world. 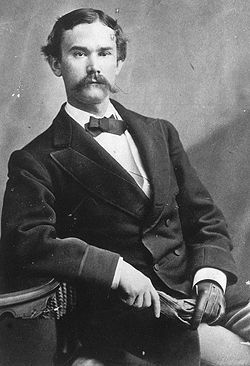 Hay was born in 1838, in Salem, Indiana, of Scottish ancestry, raised in Warsaw, Illinois, where his family relocated when he was only 3 years old. His parents were Helen Leonard Hay and Dr. Charley Hay. He was educated at Brown University (1858), where he joined Theta Delta Chi. In 1861, he was admitted to practice in the Supreme Court of Illinois. He began his public career as a secretary to Abraham Lincoln at age 22, while technically a clerk in the Interior Department. At a time when most of Lincoln's cabinet were hostile to him and vying for position and influence, Hay served also as a friend, confidant, and companion, as well as a performer of odd jobs. He would go on to become a staunch supporter of Lincoln's aims, especially the restoration and perpetuation of the Union and the emancipation of slaves, and would forge a place for himself within the Republican Party that would last a lifetime. He lived in the northeast corner bedroom on the second floor of the White House. He shared that room with his fellow secretary John G. Nicolay, who was six years older. For a few months, he served in the Union army under Generals Hunter and Gillmore. He rose to the rank of major and was later brevetted lieutenant colonel and colonel. Hay's diary and writings during the Civil War are basic historical sources. Some have credited Hay with being the real author of President Lincoln's Letter to Mrs. Bixby, consoling her for the loss of her sons in the war. Hay was present when President Lincoln died after being shot at Ford's Theatre. Hay and John G. Nicolay wrote a formal 10-volume biography of Lincoln (Abraham Lincoln: A History, 1890) and prepared an edition of his collected works. Portions of Hay's diaries and letters from 1861–1870, published in the book Lincoln and the Civil War, show the president in a far more intimate light. The portrait of Abraham Lincoln is affectionate, certainly biased in Lincoln's favor, but also contains insights and anecdotes of the homely and humorous sort that Lincoln enjoyed. Hay was named U.S. ambassador to the United Kingdom in 1897, when William McKinley became President. Some of the recognition of the longstanding community of interests between that country and the United States came as a result of Hay's stay there. In August 1898, Hay was named Secretary of State and helped negotiate the Treaty of Paris of 1898. Hay continued serving as Secretary of State after Theodore Roosevelt succeeded McKinley, serving until his own death in 1905. His contributions included the adoption of an Open Door Policy in China (announced on January 2, 1900) and the preparations for the Panama Canal. He negotiated the Hay-Pauncefote Treaty (1901), the Hay-Herran Treaty (1903), and the Hay-Bunau Varilla Treaty (1903), all of which were instrumental clearing the way for the construction and usage of the Canal. In all, he brought about more than 50 treaties, including the settlement of the Samoan dispute, as a result of which the United States secured Tutuila, with an excellent harbor in the Pacific; a definitive Alaskan boundary treaty in 1903; the negotiation of reciprocity treaties with Argentina, France, Germany, Cuba, and the British West Indies; the negotiation of new treaties with Spain; and the negotiation of a treaty with Denmark for the cession of the Danish West India Islands. In 1904, Hay was one of the first seven chosen for membership in the American Academy of Arts and Letters. Hay died in New Hampshire on July 1, 1905 at age 66. He is buried in Lake View Cemetery in Cleveland, Ohio. Hay is also renowned for his comment, written in a letter to President Theodore Roosevelt, describing the Spanish-American War as a "splendid little war." Regarding a misunderstanding between Theodore Roosevelt and Mark Hanna, Hay had commented, "This wordy city poisons men, who might be friends, against each other." Hay appears as a character in Gore Vidal's historical novels Lincoln and Empire. He appears, portrayed by John Huston, in the 1975 film The Wind and the Lion, a fictionalization of the Perdicaris Affair in Morocco in 1904. He is portrayed in the 1997 miniseries Rough Riders by actor and legendary United States Marine R. Lee Ermey. Hay was a close friend of Henry Adams, American historian and author. Hay and Adams built homes next to one another on Lafayette Square in Washington, DC, designed by H.H. Richardson. That structure was demolished and the site is now occupied by the Hay-Adams Hotel, named in their honor. Brown University's John Hay Library housed the entire library collection from its construction in 1910 until the John D. Rockefeller, Jr. Library was built in 1964. In 1971, when physical science materials were transferred to the new Sciences Library, the John Hay Library became exclusively a repository for the Library's Special Collections. His daughter, Alice Evelyn Hay, married James Wolcott Wadsworth Jr. Another daughter, Helen Julia Hay, married Payne Whitney, and they were the parents of John Hay Whitney and Joan Whitney Payson. ↑ Warren Zimmerman, First Great Triumph: How Five Americans Made Their Country a World Power (New York: Farrar, Straus and Giroux, 2002), 40. ↑ Henry F. Pringle, Theodore Roosevelt: a Biography (Orlando: Harcourt, Brace and Company, 1931), 349. Pringle, Henry F. Theodore Roosevelt: a Biography. Orlando: Harcourt, Brace and Company, 1931. Sears, Lorenzo. 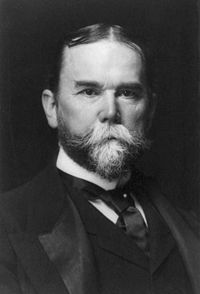 John Hay, Author and Statesman. New York: Dodd, Mead and Company, 1914. All links retrieved May 16, 2018. This page was last modified on 16 May 2018, at 16:42.